As a collector, it’s easy to become overwhelmed with finding every game on your wanted list. 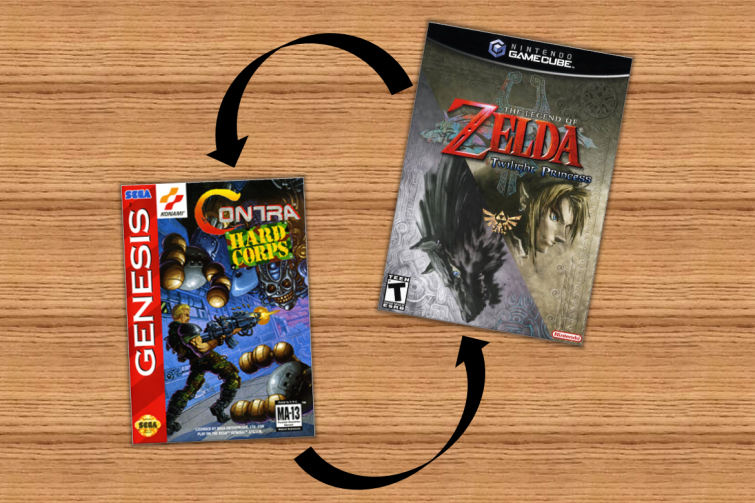 Whether you’re searching for just a handful of your favorite childhood games or entire console catalogs, being able to effectively trade with your fellow collectors will make finding all the games that you want much more approachable. I generally trade with fellow collectors on average once per month. Because none of my “real life” friends are avid collectors, every retro game trade I’ve ever conducted was handled completely through online communication and through a shipping service. Out of the 20 or so trades I’ve conducted over a handful of platforms, only in one or two trades did I come across complications with the other trader being unreliable or dishonest. ALWAY be honest. Almost all complications with a trade come from one of the traders not being totally honest about what they have or how they’re conducting the trade. If you say the disc of a game is in mint condition, then it should really be in mint condition. If you say you’re going to ship their games the next morning, then you better ship them the next morning. Choose a platform that you’re comfortable with. If you know Facebook, try trading on Facebook. If you know internet forums, then trade there. Before you start trading on a new platform, spend a few months getting to know the people, atmosphere and protocols before conducting a trade. Know what you’re trading and be specific. When you’re posting a list of what you have for trade, you’ll first need to thoroughly inspect your trade pile. Post a list of everything that you have for trade and explain what’s included (game, box, manual, inserts, extras) and what condition it’s in (explain any defects such as scratches, discoloration or bends). Include as many pictures as you can. Know what you’re looking for and be specific. If you’re posting some games that you have for trade, already have a clear idea of what you’re looking for. If you’re only looking for boxed Sega Genesis games but you don’t care if they have manuals, then specify such. If you’re only looking for NES games that you don’t have, then consider posting a link to a complete list of your NES collection. Try to find traders with a good reputation. Familiarizing yourself with people on a platform, you get to know their personalities and if they’re reliable. Some forums like Nintendo Age will have user profiles that describe the feedback left for traders. Check these to make sure you’re not dealing with someone sketchy. Understand how much games are worth. One of the most aggravating things about some game traders and sellers is that they have a tendency to over-value their own games and under-value what you have. Don’t play their games. Check completed eBay listings and know the value of every single game in the trade. Make the trade balanced. This seems almost too obvious to mention, but it’s a point that many collectors and traders still haven’t quite processed. When you’re trading a game that’s worth $50, try to trade it for $45 to $55 worth of games. If someone offers you a $15 game that you want, simply tell him/her that you’re looking for another $35 worth of games. Don’t try to over-market your games. Let your games speak for themselves. Don’t try to come off as someone who is over-selling what they have by using phrases like “highly collectible” or “super rare.” Being pushy can turn people off and make you come off as condescending. Don’t mention how much you could sell it for. If you could sell a game for a lot of money, then maybe that’s what you should do. If you’re offering a game up for trade, then that means you made the decision that you’d rather have games than cash for your games. If someone gives you a low-ball offer, tell him or her that you’re looking for more or better games than they’re offering. Supplement the trade with cash if necessary. I generally try to avoid doing this, but it’s sometimes worth it. If you want $100 worth of games that someone has for trade, but they only want $75 worth of games that you have, don’t give up on the trade. Politely offer to supplement the trade by wiring $25 to them in addition to your games. I’ve found that Paypal is the easiest way to do this. Ship the games VERY carefully. Nothing is worse than conducting a trade and receiving your half of the trade dead on arrival because the other trader did a shoddy job packaging the games. Invest in good packaging material and use lots of bubble wrap– especially if you’re sending a more expensive item. Never ship in just a padded envelope. If I’m shipping a loose DS Lite console, I may wrap it in bubble wrap, then put it in a small box and then put that box in a padded envelope. That way, it’s suspended in two layers of bubble wrap and I only have to spend $5 on shipping. Don’t look for handouts. Never ask someone to cut you a better deal for a trade based on any merits. Make the trade balanced or don’t attempt to conduct one. Don’t give handouts. I love to throw in an extra little $5 to $10 item as a bonus with most trades. And if it’s a friend, I may throw in something bigger. But if someone asks me to make the trade much more in their favor because they really want a game, I politely tell them no. Helping a stranger add to their collection isn’t worth getting ripped off. Don’t be upset when people aren’t interested in what you have for trade. If you have a stack of common games or even if you have some great games but aren’t able to connect with someone who has something that you’re looking for, don’t get discouraged. Consider posting your “for trade” pile again in a month or two or try to sell them. Leave feedback. If you completed a successful trade with someone, post that the person is a good trader. Mention if they shipped it quickly, that you’re looking forward to playing the games or if you generally recommend trading with them. Tell them thank you and say that you look forward your next trade with him/her. Report bad traders. If someone fails to give you your side of the trade or sends defective games, always try to work the situation out with the trader first. And if they outright refuse to remedy their issues, report them to forum admins or make a post describing your poor experience with a trader. Don’t be bitter about it. Describe the situation so that nobody is ripped off too. Then move on. I’m just scratching the surface of game trading, so stay tuned for future posts where I’ll dive into this topic a little bit deeper. Featured graphic by the author. Stay tuned for more collecting tips right here on Retro Chronicle. And be sure to leave any comments or tips of your own in the comment section!